Bernard Quetchenbach, author of this April's Accidental Gravity, takes time today to expand on and explore the ideals surrounding creative non-fiction. What is the line that separates fact from fiction? Perhaps to some, fiction requires a successful suspension of belief. To others, it may depend entirely on the interpretation of the individual. The landscapes we have grown to know and love carry their own history, both known and unknown to those who walk the land today. While some of these histories may seem outlandish or unreal, just because no one was around to witness, doesn't mean the tree didn't make a sound. Bighorn Canyon National Recreation Area straddles the Montana/Wyoming border, with the Crow Indian Reservation to the north. It's not a place you pass on the way to anywhere else. Because I happen to live more-or-less nearby, I've been exploring this out-of-the-way corner of the public estate for decades. Bighorn Canyon is a kind of foil, if you will, for the legendary, beloved Greater Yellowstone to its west. One is world famous, the other obscure; one biologically rich and, by interior West standards, lush, the other dry, austere, and hardscrabble. Despite the spectacular terrain, the canyon's ultimate appeal is idiosyncratic. Adulterated by Yellowtail Dam hidden in a rock fold at the canyon's north end, the Bighorn River is not pristine. 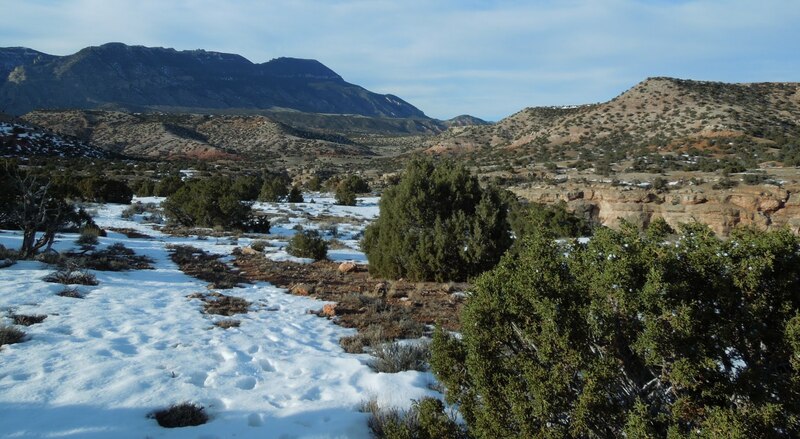 The most sought-after wild animals are feral horses, members of the PBS-star Pryor Mountain herd-- the canyon is wedged between the abrupt face of East Pryor Mountain and the more extensive, somewhat aloof, Bighorn range across the river. Even the wild sheep are not quite pure, having been introduced to the Bighorns before making their way over the ice into the rocky barrens across from Devil's Canyon. More obviously human artifacts are scattered around the prehistoric Bad Pass Trail. Later, frontier characters like pioneering journalist/cattle queen Carolyn Lockhart and dubious entrepreneur Doc Barry left enduring traces on the landscape. Most of us know locales like that, not iconic places we might have dreamed about as kids-- Yellowstone or Wrigley Field or Stonehenge-- just places, unique and strange, full of stories without form or resolution except for the shaping that occurs when experience finds a home on the way to memory. That hidden cove or canyon you think no one else can see. I started writing poetry seriously, so to speak, in college. When my interest in essays emerged later, I worried about the burden of truth as literal reality; being accountable to the actual if subjectively encountered planet seemed like an awesome responsibility. Writers always have potentially conflicting loyalities: to the sentence, to memory, to theme and coherence. I suppose when I write nonfiction my ultimate loyalty is to the is-ness we call the world, that numinous whatever in which our lives-- real and imagined-- happen. The payoff for such loyalty in nonfiction is that reality has the right to be bolt-out-of-the-blue unexpected or coincidentally perfect. Anything, as we say, is possible. We know that we perceive a mediated world, that the boundary between fact and fiction is never exact and impervious. But we're finding the peril of taking that too far-- reality as virtual, fact as "alternative." If objective reality is an illusion, solipsism is a more dangerous one. If you were standing on the brink of Bighorn Canyon, or slogging through snow and gumbo mud in tracks left by shoeless horses, you wouldn't doubt your surroundings. You'd be cold, for one thing, and the wind would be cutting. A golden eagle could be edging the canyon, and a flock of pinyon jays might nose around the old post office at Hillsboro, Barry's ghost town. A writer, no matter how gifted, can't give you that. Reading about the canyon, however, just might remind you of your own accidental place-- a ravine in Indiana, a fogbound California shore, a ruined farmstead in Vermont with cows grazing on what was the roof and a sleigh still intact in the outbuilding rubble. Maybe just a city pier on Lake Ontario. Some place you couldn't have made up as strange and resonant as it is. A place with consequences you can fall through if you aren't careful, where unexpected meanings can be uncovered and created simultaneously. 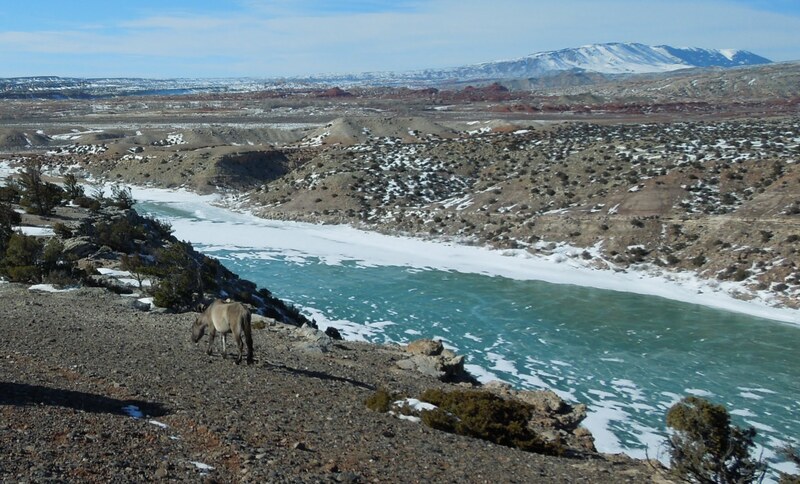 One cool March day among the junipers and wild horses ended with a last short walk to the edge of Bighorn Canyon. Below it was already evening, and the ochre rock walls were starting to fade. Until, that is, a crepuscular sunshaft spotlighted a full-curl bighorn ram surveying the shadowed depths from a briefly glowing ledge across the water. It was an ephemeral moment of transcendent circumstance. Too much, you might reasonably conclude. I wouldn't believe it either. If it hadn't happened just that way.